Tears for Fears are noted on the Free Press Summer Festival 2015 Line-Up. This festival has several positive reviews. The event will take place on the 6th and 7th of June. Tickets are for both days. Whatever you pay, you get access to both days. Suggested Lodging: After all that festival frolicking you’re going to want a nice place to sleep. We highly suggest Hyatt Houston. Should be about $159 + tax per night if arriving on a Friday evening and choosing a standard room (which should be sufficient for most but other options are available including suites…and they are worth it). You’re going to want to get your pre-festival rest and Hyatt has some of the best beds of the hotel chains we frequent. Ultra Experience is the Silk Pajamas Package/The Ultimate Experience, it’s a little over $1000 USD after admin fees. 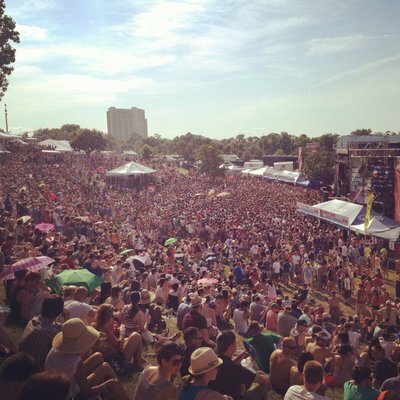 Online Review Sites such as Yelp rate FPSF fairly high – photo by Mark G. See his review. Early concerns… Believe it or not we’re getting feedback less than a few minutes after this event was posted. Many are VERY excited that TFF is going to be out and about. However, some just aren’t fans of festivals because they only want to see TFF and have no sincere interest in other bands. “Paying one huge ticket price for one show is worth it but not practical in these slow to go grow economic times,” one follower stated. Our suggestion is to please consider the area and all of the fun tourist sites and activities available. Houston is a pretty cool city with lots to do. There had been some low line chatter aka “convos on the DL” about 2 years back that this beloved band would be doing some festivals. And as we loyalists know, they make good on their word and often at just the right time. *Updates to this post will be tweeted and posted to FB. Posted on 25/02/2015 by International Business and Cultural ExchangePosted in Tears For Fears Live Shows, Tears for Fears Regional Fan Club News & Online FunTagged Curt Smith, Roland Orzabal, Summer Concerts, Tears for Fears, Tears for Fears 2015, Tears For Fears Concerts, Tears for Fears Houston. Previous Previous post: Tears for Fears Fan Experiences: The Best Day of Her Life!